It is logical to handle a suspected murder weapon at any crime scene with care. While witness account may seal a case, protocol demands that an investigation happen and record what really happen. Securing a murder weapon is basic procedure in many parts of the world, except Eldoret. 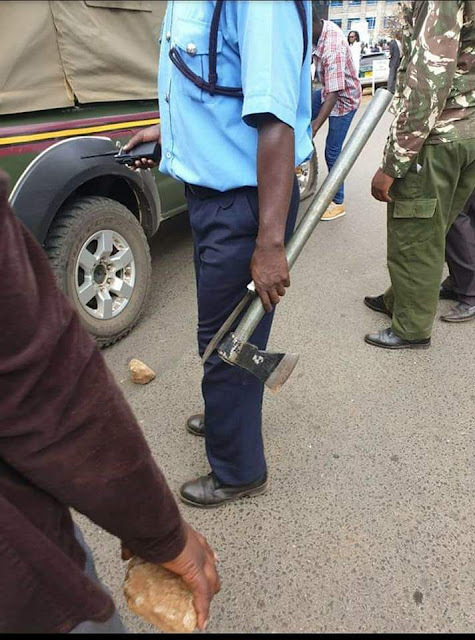 A picture of a police officer handling the axe without gloves shows that the system might not be working as well. The police came in to save the assailant after bodaboda operators descended on him. They had no time to handle the weapon as per procedure but needed to take in the weapon. However, a working system would ensure that police always have gloves with them : the same way they always have handcuffs. Its only in Kenya where police handle murder weapon without wearing gloves very unprofessional..